Lakewood residents Aaron Cooper, Jeff Davis, Jim Hayes, Carl Orban, Dana Paul and Allison Urbanek comprise the all-star squad of volunteers known as the “A Team.” This team spends various weekends throughout the year tackling major volunteer housing projects on behalf of the LakewoodAlive Housing Outreach Program. Although they vary in age (ranging from early-thirties to upper-sixties) and employment (ranging from corporate professionals to retirees), all six members of the A Team share two distinct traits: A general level of expertise with building projects and a strong desire to use their talents to help fellow community members in need. Lifelong Lakewood resident Pam Schraff knew she had a major problem. The front porch at the Lakewood Avenue home she’s occupied for 41 years had deteriorated to the point where it had become a safety hazard, both for Pam and her visitors. Thanks to the leadership of Allison Urbanek – LakewoodAlive’s Housing & Internal Operations Director – the group took on this ambitious project. 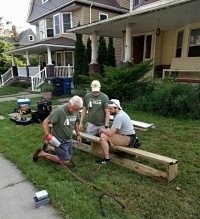 On six occasions between the scorching heat of July and the chill of December, the A Team convened at Pam’s home to complete an extensive porch repair that consisted of replacing flooring, constructing new porch steps, incorporating a new step railing and installing a new storm door. 2018 proved a banner year for the A Team. In addition to rebuilding Pam’s porch, the group successfully reconstructed a garage roof for an elderly couple on Rosewood Avenue by laying new sheathing and reshingling the roof. This 1907 home on Rosewood has been within the owner’s family for nearly seven decades. In total, the A Team completed two major volunteer housing projects this year, accumulating 164 total volunteer hours and generating $12,000 worth of economic impact for low-moderate homeowners within our community. Project materials were funded through LakewoodAlive's 80/20 Volunteer Project Supply Fund, whereby the homeowner pays 20 percent of the cost and LakewoodAlive covers the remaining 80 percent using funding provided by First Federal Lakewood. Pam observed the A Team’s camaraderie and knack for fun throughout the porch rebuild project. At one point the group discovered an old grocery store sign underneath her porch and took time to investigate its historical significance. On another occasion they found a knot in a piece of wood and took time to consider how that would impact the porch over time.